Aim of the Study: Malaria is a major health problem in the tropics with increased morbidity and mortality. Thrombocytopenia is a common finding in malaria. Although a reliable diagnostic marker, prognostic implications could vary in the two types of malaria. This study was undertaken to assess the presence and severity of thrombocytopenia in malaria patients. Design: A total of 120 patients were included in the study and identified positive for malaria parasites on peripheral smear examination with conventional microscopy. Platelet count was done on a fully automated, quantitative, hematology analyzer. Results: Thrombocytopenia was noted in 63.33% cases. The mean platelet count in Plasmodium vivax (Pv) malaria was 1,27,652/μl (SD 78,269) with a range of 8000-3,50,000/μl, as against Plasmodium falciparum (Pf) malaria where the mean platelet count was 78,500/μl (SD 51,485) with a range of 9000-1,90,000/μl. Platelet count < 50,000/μl was noted in only 17.4% cases of Pv malaria as against 33.3% cases of Pf malaria. 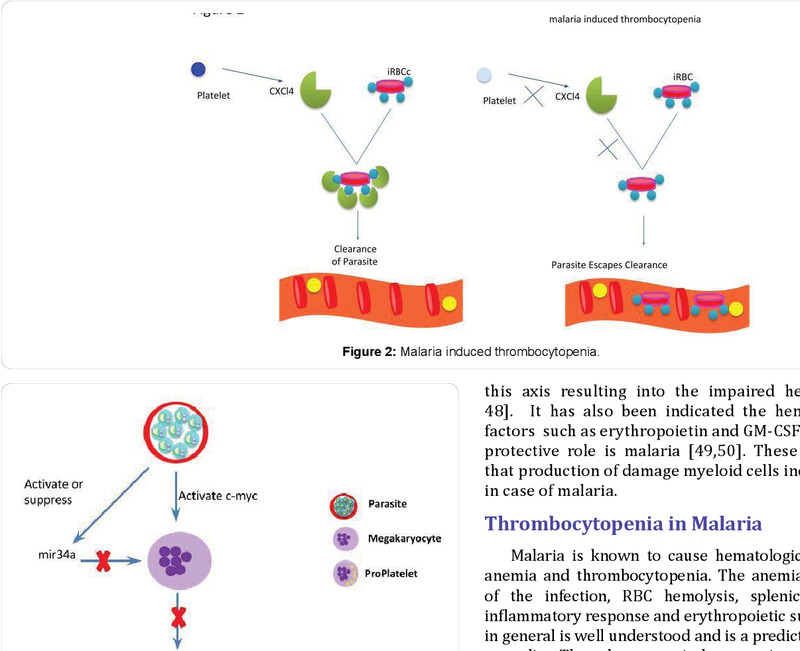 Conclusion: Although absence of thrombocytopenia is uncommon in malaria, its presence is not a distinguishing feature between the two types of malaria. Our study stresses the importance of thrombocytopenia as an indicator of acute malaria. Malaria is a global health problem with an annual incidence of about 216 million cases of malaria and an estimated 6,55,000 deaths in 2010. Malaria is endemic in 91 countries and India contributes 77% of the total malaria cases in Southeast Asia. Early diagnosis remains the key to the effective management of malaria. ,, The examination of thick and thin blood films under the light microscope is the gold standard in the diagnosis of malaria. It is informative and inexpensive but it requires expertise and repeated smear examinations. ,, Polymerase chain reaction (PCR) is the most sensitive method but it cannot be used for routine purposes. , The malarial antigen-based rapid diagnostic tests are a valid alternative to microscopy, but they are expensive. Hematological abnormalities have been observed in patients with malaria, with anemia and thrombocytopenia being the most common. The aim of this study was to identify the significance of thrombocytopenia in malaria and its relevance as an early diagnostic tool in malaria. The presence of thrombocytopenia may heighten the suspicion of malaria, thus prompting a more diligent search for the malaria parasite and an early administration of the specific therapy. This study was also undertaken to correlate the presence and severity of thrombocytopenia with the type of malaria as there is paucity of data on this correlation in Indian studies. The prospective study was conducted for a period of six months. Patients of all ages who were either hospitalized or attending OPD were included.. Out of 394 requests for peripheral blood smear examination, 120 patients were positive for malaria parasite. Of these 92 were positive for Pv, 18 for Pf and ten had mixed infection. Pv monoinfection was confirmed by rapid diagnostic test (MAL CARD by J. Mitra). Complete blood cell count was done using an automated cell count analyzer (Sysmex XS 800i). 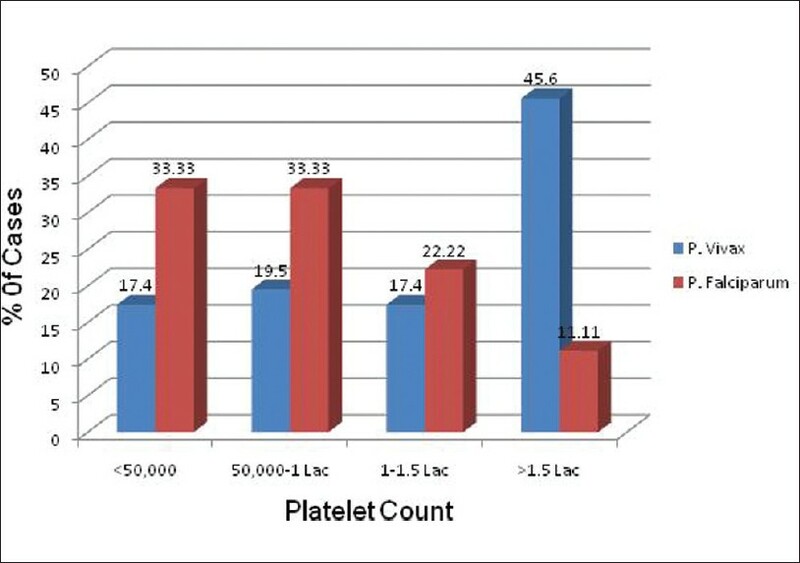 Platelet count was the number of thrombocytes derived from directly measured platelet pulses, multiplied by a calibration constant and expressed in thousands of thrombocytes per microliter of whole blood. Coefficient of variation (CV) for the platelet count was ≤7%. A platelet count of less than 150,000/μl was used to define thrombocytopenia. Patients were divided into three subgroups based on platelet count. Thrombocytopenia was considered severe if platelet count was <50,000/μl, moderate if 50,000-100,000/μl and mild if 100,000-150,000/μl. Subjects with a diagnosis of associated dengue fever and drug-induced thrombocytopenia were excluded from the study by confirming it by dengue kit (rapid diagnostic test) and proper history respectively. The study limitation was that PCR was not done. Data was entered on an Excel spreadsheet and statistical analysis was performed with SPSS Version 10. P values less than 0.05 were considered significant. In our study 120 patients with malaria positivity were investigated with platelet count. Out of 120 patients, 76 (63.33%) patients were males and 44 (36.66%) patients were females. Maximum patients (43.33%) were under the age of 20 years [Table 1]. The commonest presenting manifestations were fever with chills and rigors, headache and backache. Only ten patients presented with bleeding manifestations in the form of petecchiae, gingival bleeding and epistaxis. In the study group of 120 patients 92 patients were positive for Pv and Pf was detected in 18 cases. Mixed infection was seen only in ten cases. Platelet count less than 1,50,000/μl was noted in 63.33% cases. The mean platelet count in Pv malaria was 1,27,652/μl (SD 78,269) with a range of 8000-3,50,000/μl, as against Pf malaria where the mean platelet count was 78,500/μl (SD 51,485) with a range of 9000-1,90,000/μl [Table 2]. Platelet count ranging from 50,000/μl to 150,000/μl was noted in 37% cases of Pv malaria as against 55.5% cases of Pf. Platelet count < 50,000/μl was noted in only 17.4% cases of Pv malaria as against 33.3% cases of Pf malaria [Table 3]. The risk of thrombocytopenia was more in Pf as compared to Pv malaria. Odds Ratio (OR) = 6.72 (95% Confidence Interval (CI) 1.460-30.916). [Figure 1] shows the graphic representation of the platelet count range in correlation with the type of malaria. Mean hemoglobin concentration was 10.8 g/dl in subjects with Pf malaria and 11.5 g/dl in subjects with Pv malaria (P < 0.05) and the lowest hemoglobin concentration was 6.0 g/dl in Pf infestation and 7.5 g/dl in Pv infestation. There was no statistically significant difference noted in the mean total white cell count in subjects with Pf and Pv malaria (8033/cumm versus 8644/cumm, P=0.154). Age-wise distribution of cases with thrombocytopenia showed that it was maximum in the 0-10 years and lowest in the 31-40 years age group in Pf, Pv and mixed malaria infection [Table 4]. In our study, 63.33% patients with malaria presented with thrombocytopenia which is in close approximation to other studies reporting low platelets of 57% and 48%. , Systematic review of Indian studies, estimating thrombocytopenia in malaria patients is shown in [Table 5]. Finding of thrombocytopenia with anemia is an important clue to the diagnosis of malaria in patients with acute febrile illness, hence patients with acute febrile illness without localizing signs and having combination of anemia and thrombocytopenia should alert the treating physician about the possibility of malaria infection which can be confirmed with specific tests. Presence of thrombocytopenia is not a distinguishing feature between the two types of malaria. In our study it was found that the prevalence of Pv was more than Pf. It is usually believed that thrombocytopenia is more common in Pf malaria; contrary to the popular belief, Pv can also give rise to thrombocytopenia as was seen in our study. Severe and complicated malaria is usually caused by the Pf parasite, but Pv usually considered a benign parasite that causes disease resulting in low case-fatality rates, can also occasionally cause severe disease. Reported severe manifestations of Pv include cerebral malaria, liver dysfunction, acute kidney injury, severe anemia, acute respiratory distress syndrome, shock, abnormal bleeding, and multiple organ failure. Profound thrombocytopenia with platelet count as low as 5000/μl has been reported in the Indian literature in a 43-year-old female patient with Pv malaria. This must be considered in the context that very low platelet counts can be transient in the course of malaria illness and may not necessarily have prognostic implications or merit platelet infusions. Most severe malaria patients have thrombocytopenia; however, platelet concentrate transfusion is indicated only in patients with systemic bleeding. Clinical bleeding in severe malaria is not a common feature and occurs in less than 5-10% of individuals with severe disease. Platelet and fibrin deposition are rarely seen in the capillaries of patients at postmortem and despite numerous studies indicating elevated levels of fibrin degradation products, clinical DIC is rare. Thrombocytopenia is common in the laboratory diagnosis of malaria and presence of thrombocytopenia is not a distinguishing feature between the two types of malaria. Its presence in patients who present with acute febrile illness in the tropics, increases the probability of malaria. This may be used in addition to the clinical assessment, to heighten the suspicion of this disease. If thrombocytopenia is present, malaria has to be ruled out before performing expensive tests to rule out other febrile conditions, so that a prompt treatment can be initiated. 1. World Health Organization. WHO 2011, Malaria Fact Sheet. 2. Faseela TS, Ronald AR, Anita KB, Chaithra SM, Rai Y. Diagnostic Value of Platelet Count in Malaria. J Clin Diagn Res 2011;5:464-6. 3. Khan SA, Ali W. Platelet count in malaria. Pak J Pathol 2008;19:86-8. 4. Rathod DA, Patel V. Diagnosis of acute malaria by laser based cell counter with comparison of conventional and recent techniques in Indian scenario. Indian J Pathol Microbiol 2009;52:185-8. 5. Lathia TB, Joshi R. Can hematological parameters discriminate malaria from nonmalarious acute febrile illness in the tropics? Indian J Med Sci 2004;58:239-44. 6. Tangpukdee N, Duangdee C. Malaria Diagnosis: A brief review. Korean J Parasitol 2009;47:93-102. 7. Khan SJ, Khan FR, Usman M, Zahid S. Malaria can lead to Thrombocytopenia. Rawal Med J 2008;33:183-5. 8. Jadhav UM, Patkar VS, Kadam NN. Thrombocytopenia in malaria - correlation with type and severity of malaria. J Assoc Phy­sicians India 2004;52:615-8. 9. Niazi GA. Haematological aspect of malaria in a population based hospital, Saudi Arabia. J Egypt Soc Parasitol 1995;25:787-93. 10. Mert A, Ozaras R, Tabak F, Bilir M, Ozturk R, Aktuglu Y. Malaria in Turkey: A review of 33 cases. Eur J Epidemiol 2003;18:579-82. 11. Kute VB, Trivedi Hl, Vanikar AV, Shah PR, Gumber MR, Patel HV, et al. Plasmodium vivax Malaria-associated Acute Kidney Injury, India, 2010-2011. Emerg Infect Dis 2012;18:842-5. 12. Kakar A, Bhoi S, Prakash V, Kakar S. Profound thrombocytopenia in Plasmodium vivax malaria. Diagn Microbiol Infect Dis 1999;35:243-4. 13. Fajardo LF, Tallent C. Malarial parasites within human platelets. JAMA 1974;229:1205-9. 14. Kreil A, Wenisch C, Brittenham G, Looareesuwan S, Peck-Radosavljevic M. Thrombopoietin in Plasmodium falciparum malaria. Br J Haematol 2000;109:534-6. 15. Srichaikul T, Pulket C, Sirisatepisan T, Prayoonwiwat W. Platelet dysfunction in malaria. Southeast Asian J Trop Med Pub Health 1988;19:225-33. 16. Mohanty S, Marwaha K, Ghosh S. Functional and ultrastructural changes of platelets in malaria infection. J Clin Invest 1988;71:832-6. 17. Moulin F, Lesage F, Legros AH, Maroga C, Moussavou A, Guyon P, et al. Thrombocytopenia and Plasmodium falciparum malaria in children with different exposures. Arch Dis Child 2003;88 : 540-1. 18. Mohanty D, Ghosh K, Nandwani SK, Shetty S, Phillips C, Rizvi S, et al. Fibrinolysis, inhibitors of blood coagulation, and monocyte derived coagulant activity in acute malaria. Am J Hematol 1997;54:23-9. 19. Murthy GL, Sahay RK, Srinivasan VR, Upadhaya AC, Shantaram V, Gayatri K. Clinical profile of falciparum malaria in a tertiary care hospital. J Indian Med Assoc 2000;98:160-2. 20. Mohapatra MK, Padhiary KN, Mishra DP, Sethy G. Atypical manifestations of Plasmodium vivax malaria. Indian J Malariol 2002;39:18-25. 21. Kumar A, Shashirekha. Thrombocytopenia: an indicator of acute vivax malaria. Indian J Pathol Microbiol 2006;49:505-8. 22. Prasad R, Das BK, Pengoria R, Mishra OP, Shukla J, Singh TB. Coagulation status and platelet functions in children with severe falciparum malaria and their correlation of outcome. J Trop Pediatr 2009;55:374-8. 23. Kochar DK, Das A, Kochar A, Middha S, Acharya J, Tanwar GS, et al. Thrombocytopenia in Plasmodi­um falciparum, Plasmodium vivax and mixed infection malaria: A study from Bikaner (Northwestern India). Platelets 2010;21:623-7. 24. George P, Alexander LM. A study on the clinical profile of complicated Plasmodium vivax mono-infections. Asian Pac J Trop Med 2010;3:560-2. 25. Srivastava S, Ahmad S, Shirazi N, Verma SK, Puri P. Ret­rospective analysis of vivax malaria patients presenting to ter­tiary referral centre of Uttarakhand. Acta Trop 2011;117:82-5.